Review date: 20 September 2003. Another little silver plastic thing that plays music. This one's the PR3011, sold under PanRAM's Seitec brand. Seitec's better known for memory products, but personally, I'm just thankful that this isn't a thousand-brands chameleon like the TGE players I've checked out here and here. 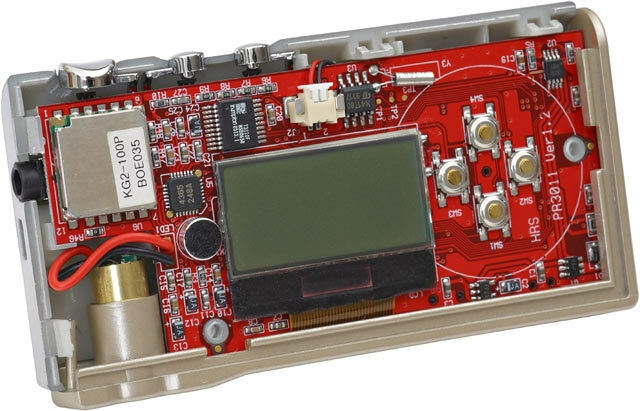 The PR3011 has quite an encrustation of features in its slim little case. It's 90 by 46 by 14 millimetres in size, and weighs only 45 grams, but it's got a built-in rechargeable battery, an FM radio, a recording feature (from a built-in microphone or from the radio) and a clock. And - wait for it - a laser pointer. No mention of bells, whistles or gongs, but they're probably coming in the next model. Lots of features aren't necessarily a good thing. Fortunately, though, the one word I'd choose to describe the PR3011 is "quirky", not "crappy". The PR3011 can also be forgiven for some sub-optimal aspects, when you consider its price. Here in Australia, Aus PC Market are selling the 256Mb version of the PR3011 for $AU231, including Australian delivery. That's $AU16.50 cheaper than the 256Mb MP317 (of which they have no stock, as I write this). They also have a 128Mb version, but it's $AU203.50 delivered. No sensible person would buy that, when twice as much memory costs only 13.5% more. Is the 256Mb PR3011 worth buying, though? The PR3011 comes with a normal selection of extras. You get the player itself, a USB big-to-little cable (unlike the TGE players, the PR3011 can't plug directly into a USB port), some headphones, a multilingual paper manual, a software mini-CD, and another little lead. The second lead has a USB socket on one end and a DC barrel connector socket on the other. 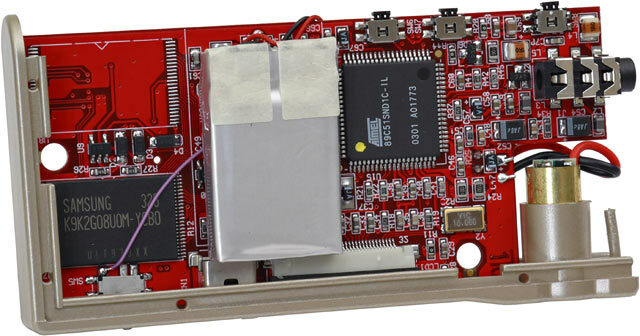 The PR3011 charges its battery from USB power, whenever it's connected to a PC. This adapter lets you use a five volt DC plugpack (which you'll have to hunt up yourself in your local electronics store) to charge the player if you don't have a computer handy. Charging takes a mere 22 minutes, and gives you a nominal five and a half hours of listening time. The little 77mm CD contains nothing but drivers for the player and several other PanRAM products. You should only need to bother with it if you're running Windows 98SE, the oldest OS that'll work with the player. WinME, Win2000 and WinXP, and Mac OS 9, should see the player as a USB Mass Storage Device, without needing extra drivers. The manual is my second least favourite thing about the PR3011 (we'll get to number one on the hit list shortly). It's not incomprehensible - the English in it is less quirky than that to which technology aficionados are accustomed. The manual's just practically unreadable without a magnifying glass. Opened out flat, the manual is a bit smaller than A6 size. It was obviously meant to be printed on at least A5 sized paper, but someone at PanRAM then decided to package the PR3011 in a natty little cylindrical box with no room for a booklet that big. Rather than increase the page count or drop some languages from the manual, they just printed it really really tiny. As a result, capital letters are only about a millimetre high - slightly bigger than three point. 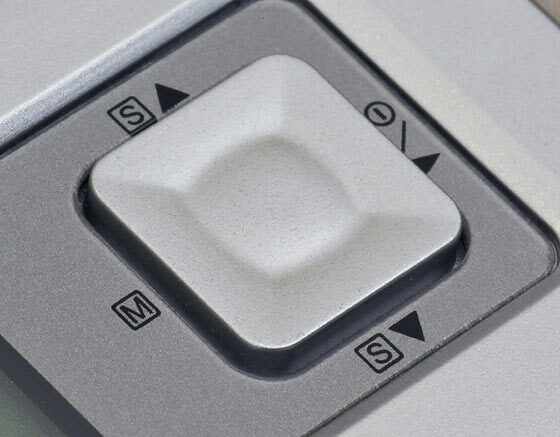 So I don't think it's indicative of any early macular degeneration on my part that I found the glyphs used to indicate what button to press - black circles with the button symbol in white inside them - extremely difficult to read. Would it have killed them to put a PDF version of the manual on the software CD? But enough carping. If you're over the age of 20, just invest in a magnifying glass to go with your MP3 player, and you'll be set. I was ready to complain about the headphones too, but they're actually not too bad. Little MP3 players generally come with quite awful headphones. They're usually in-ear units, which is not a problem in itself as long as you don't mind that kind of headphone. But there are good in-ear phones and bad ones, and the latter type are the ones that often get bundled with players, to keep costs down. These 'phones aren't hi-fi masterpieces, but they're better than usual. 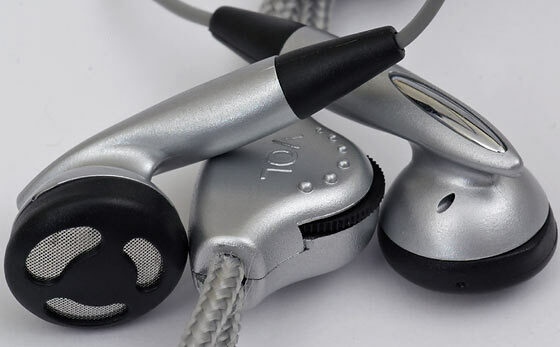 As is common for small MP3 players these days, the headphones have short cables and a braided neck strap that sheaths the cables for some of their length, and there's a lanyard at the end of the strap that you can pass through a matching hole on the player. The player can, therefore, swing around your neck or sit in your top pocket. These 'phones also have an inline volume control. The MP3 player has its own volume control, but (here comes another quirk) it doesn't work when you're using the FM tuner. For some reason, the volume control buttons only work as tuning buttons in FM mode, so you have to use 'phones with their own volume control if you want to be able to turn down the radio. The radio's maximum volume isn't quite as high as the MP3 players', though, so maximum volume isn't likely to burst your skull. The only thing I found to really dislike about the bundled 'phones is that someone forgot to put "L" and "R" markings on them. Another quirk, but one you can rectify with a little critical listening and a marker pen. One standard 1/8th inch headphone socket, two small buttons for volume control and radio tuning, and one large button that does nothing but activate the laser pointer. 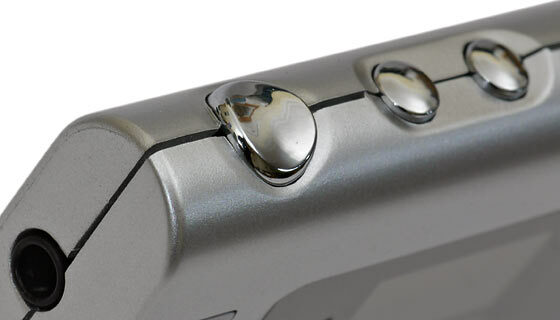 On this side, from left to right, there's the hole the laser shines out of, the mini-USB socket, and a slider which experienced mobile audio users will immediately identify as a hold switch, to stop the other buttons from doing anything. Experience counts for nothing here, though, because we're in Quirk Country again. That's a reset switch. Fortunately, the PR3011's controls are heavily enough sprung that the player doesn't really need a hold switch. Slide the reset switch and the player just turns off, and won't turn on again until you slide it back. Then it'll work normally again, but will have forgotten all of its settings, including its radio station presets. Not the time, though; it remembers that regardless. Another quirk. The laser - which counts as a quirk all by itself - is, of course, red (red laser diode modules are about a thirtieth of the price of the laser-crystal-filter triads still needed to create green beams), and is respectably bright. It works like a good quality keychain laser, and the player's design makes it easy to aim. I have independently verified its utility for normal laser tasks. This is the worst thing about the PR3011. Unfortunately, it's also the principal control. For some reason, PanRAM decided to put a one piece joypad-style controller on the PR3011, only about 13 millimetres square. There are four switches under the controller, and you need to use all of them quite often, but the design of the thing makes this difficult. It works better if you put your thumb in the middle of the square and tilt it in the appropriate direction, rather than trying to press the edge, but it's still a problem. It would be excessively charitable to call this a mere quirk. The PR3011's little LCD screen is quite good. The above shot shows it with its blue LED backlight on; the backlight only stays on for a few seconds after you press a control, to save battery power. You can disable the backlight completely, but you can't extend its on-time. The screen has enough resolution for a decent amount of information - including the time and date, when it's in FM mode or in MP3 mode but not playing anything. There's a dedicated time display mode as well, which has an auto power on function that lets you use the PR3011 as an alarm clock, provided you connect it to speakers or sleep with your headphones on. Quirk. More usefully, the PR3011 has no trouble displaying very long file names in their entirety. The song name scrolls, which is what caused the blur in the above long-ish exposure photo. Here's another quirk, though; the PR3011 can read ID3v2 artist and title tags, and will display them instead of the file name when playing, if a file has them. It can't read ID3v1 tags, though. If a file only has ID3v1 tags, all you get is the filename. The PR3011's menu system doesn't make good use of the screen resolution. The menus are all identified by these little two or three letter names-in-boxes, with a thing in the top left corner that tells you how many options there are in the current menu, and which one you've selected. The menu system works passably well, though, and there's a neat map of it on one page of the minuscule manual. Only the silly joypad controller really hindered me when I was using it. Pleasingly, it's possible to use the menu system while you're playing a track. Among other things, this makes it easy to verify that the different equalisation settings aren't good for much. The bass-heavy "ROC" setting compensates a bit for weedy headphones, but that's about it. On recent Windows flavours, the PR3011 is a plug-and-go device. Connect USB cable, wait a moment, and a new removable drive is available. Everything it plays and records just sits in the root directory. Like all sensible MP3 players, the PR3011 can be used as a portable storage device for any files you like. It can only play MP3 and WAV sounds (there's no Windows Media Audio compatibility, in case you care), but it can store anything that'll fit. There seems to be a quirk here, too. When I plugged the player in when it was turned on, it was likely to switch briefly to USB-connect mode, then back to the mode it was in before, causing the computer to think it was a defective USB device. Unplugging it turned it off, though, and it behaved itself when I plugged it straight back in again. This "256Mb" player has only 249Mb real capacity, which is actually a bit more than you'd expect considering the usual storage device lie factor. It actually contains a full 256 megabytes of flash RAM (plus a spare eight megabytes that's there to be automatically swapped in if and when cells die in the main memory block), but the player's own firmware takes up some of its storage. Result: A seven megabyte swindle. I was expecting more like twelve, though, so this is OK with me. You get data into and out of the memory via a USB 1.1 connection, good for a theoretical user data transfer rate of about one megabyte per second. MP3 players never come very close to that limit, in my experience, and writes are slower than reads. This player doesn't buck the trend; the manual quotes a 500 kilobyte per second write speed (quite good), and 700 kilobytes per second for reads (not so great by USB-drive standards, but on par for MP3 players). I found the read speed spec quite accurate, but writes were actually faster, around 600 kilobytes per second for large amounts of data. If you can deal with the annoying square controller, the PR3011 is quite easy to use. It's often a bit slow to respond to button presses (a problem it shares with many MP3 players, including the TGE models), it doesn't remember where it was up to in a file if you turn it off while playing, and its fast-forward and fast-reverse seeking isn't terribly speedy. But by and large, it works. It's even got regular and random play, plus a rather cumbersome A-to-B repeat feature that lets you select a section of a file to play, for language or music learning purposes. There's no playlist editor, but it'd be painful to use on a screen this small. There are, however, yet more quirks. Back in the olden days, many MP3 players had serious personality defects. They'd skip if you tried to play Variable Bit Rate (VBR) files, for instance, or they just didn't like anything above a certain bit rate. The Seitec player's certainly not a throwback to those days; if it's an MP3, the PR3011 seems to be able to play it. But it's weirder than the Sigmatel-powered TGE players. I had no trouble finding files it had issues with. For reasons I couldn't quite figure out, for instance, a 256 kilobit per second Constant Bit Rate (CBR) version of Beethoven's Sixth played with an odd raspy sound; it was faint, but clearly audible in the quiet passages at the beginning of the piece. Other files encoded in the same session from the same CD were fine, though. On one unremarkable 128 kilobit per second track, the PR3011 consistently went silent for about two and a half seconds at the one minute eleven second mark, if I played the song from the start. If I rewound back past the glitch and tried again, it was always fine. On another track, the PR3011 always made one of those classic little underwater-bubble glitch sounds at the eight second mark, whether the track had been played from the beginning or rewound back. No such problem truly existed in the file. I only heard the raspy sound on one track, and it was quiet enough that background noise could easily have swamped it. It also wouldn't have been noticeable against loud music. The glitching was occasional, and didn't annoy me much; it just mystified me. And most tracks I tried, in different musical genres, sounded perfectly fine on the PR3011. I, therefore, wouldn't say that its playback problems are critical. If steam comes out of your ears any time a music device makes an untoward noise, though, then the PR3011's not for you. The PR3011's FM radio works well, except for the no-volume-control thing. Like pretty much every headphone stereo FM radio, the PR3011 uses the headphone cord as its antenna, so you'll need to fiddle with the cord to get good reception. It seems to work passably well even with the short cable on the standard 'phones, and also worked fine when I plugged in my long-cabled Sennheisers. The TGE MP317's radio is built into its headphones, and pretty much useless; the CP3011's radio actually works. It's got up and down tuning buttons, it's got one-way scanning (it only goes up the dial, and wraps around at the end), and it's got 30 memory locations, which ought to be enough for anyone. It just doesn't have a volume control. Quirk. The PR3011's voice recording feature is good, too. The player has a reasonably sensitive microphone, which can pick up normal speech at arm's length with no trouble. It's also pretty omnidirectional, like the mics in the TGE players; you don't need to point the mic grille at the person speaking. 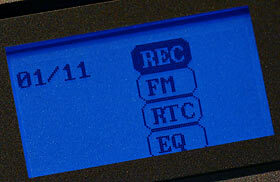 The PR3011 can also pause during recording, without making you create a new file; the TGE players can't do that. On the minus side, the PR3011 makes you navigate a few menu steps to get to the record feature. You can't just hold down one button to turn recording on. The PR3011's recording files are mono, eight bit, 8kHz sample rate uncompressed WAVs - 64 kilobit per second data rate, for about nine hours of record capacity if you don't have any other files on the "256Mb" version of the player. The player can also delete files one by one, if you need to clear some space for more recordings. There's a delete-everything format option, as well. And yes, the PR3011 can record from the radio. 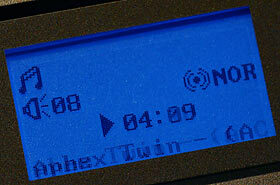 This works the same way as voice recording - so it records FM in mono, eight bit, 8kHz as well. So this feature is of limited utility. Quirk. My review TGE MP317 is still here, so I swapped headphone plugs between it and the Seitec player. The MP317 had no trouble with any of the files that were quirkified by the PR3011. Win for TGE. 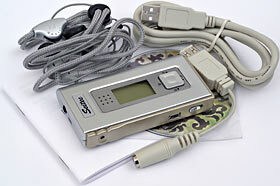 Or for Sigmatel, who make the chips that power the TGE players; the Seitec is Atmel-powered. There's also no comparison at all in the peak volume department. The PR3011 plays fairly loud; the MP317 plays very loud. 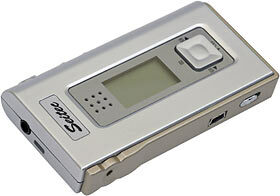 You could probably get perfectly good volume out of an MP317 for two people listening at once with a Y-adapter; not so with the Seitec player. Never mind the bleeding ears, though. The Seitec player's loud enough for most purposes, especially with in-ear headphones. In-ear 'phones are often not actually terribly efficient, but the fact that they're jammed into the end of your ear canal gives them a big loudness-per-milliwatt advantage. The PR3011's only held together by two screws and some clips. That's practically a written invitation to crack it open, if you ask me. The front of the natty red circuit board. 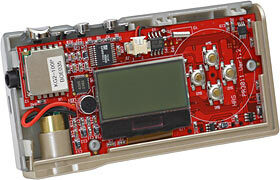 Note the four main-button switches to the right, the shielded FM tuner chip at the top left, and the laser module at bottom left. Some more meaty stuff on the back. One tiny 3.7 volt 230mAh lithium ion battery, one Samsung K9K2G08U0M two gigabit flash RAM chip (and room for another, for a "512 megabyte" version), and one Atmel AT89C51SND1 MP3-player-on-a-chip. I don't know whether it's the Atmel chip, that's causing the PR3011's playback oddities. It seems like a good bet, though. Problems like this are commonly corrected with firmware updates, but I don't know of any way for users to update a PR3011's firmware. This MP3 player is surprisingly useable, considering its numerous idiosyncrasies. Its only real flaw is the square control button, and that's not too much of a pain if you're mainly just pressing play and pause. If the PR3011 were more expensive - $AU350, say - then I couldn't recommend it. For a premium price, you should get a bug-free player with really nice controls and a spiffier screen. But even if you don't care about the radio and the darn laser pointer, this player is still one of the cheapest 256Mb (well, 256Mb-ish) options out there. If its extra features appeal to you, it's an even better deal. So if none of the multitudinous quirks mentioned above turn you off - and none of them made me hate it - I heartily recommend this player. Aus PC Market no longer sells this MP3 player, but they've got lots of others!